Continuous LFT and GLFT can be supplied. Any reel weight can be produced to meet various specifications. This type of film can be printed with a “Safety Warning” logo. Both SWS and CFS can be produced for use on both L/Sealers and Sleeve Sealers. These two types of films can, if needed, be micro perforated. The minimum thickness for garment film is 20microns. In addition to the above we can also supply Shaped Bags on a Roll with an Interrupted Seal. The tear-off can be any length from 500mm to 2134mm. These are suitable for use in laundries, clothing manufacturers/processors and dry cleaners. GLFT up to 610mm x 813mm is produced especially for Bridal Gowns. 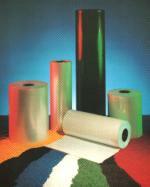 Straight Seal tear-off bags on a roll can also be produced for over bagging with a minimum thickness of 30microns. Again this can be printed with a “Safety Warning” logo.